Samantha had a great time this past year in a ballet class. She attended weekly classes and was working towards a big dance recital at the end of the term. 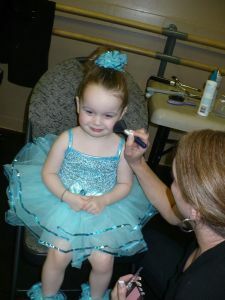 Before the recital, they did a dress rehearsal and parents were allows to attended the rehearsal and record the show. You can see some of that footage in the movie. After the rehearsal, Samantha had two performances at Centrepoint Theatre. We got tickets for the first evening so we got the chance to watch most of the show. Samantha was enthralled with the music and dancing and thankfully there was enough room in the aisle for her to dance along. A couple of numbers before her performance, we escorted her backstage and then quickly returned to our seats to watch. She did really well and only fell down once. After her number, we picked her up from backstage and watched the rest of the show. Even though it finished up very late at night, she was still so excited to watch all of the dancers and loved the music. The next day, she performed again. We didn’t have tickets that night so we waited backstage while she performed and then went home afterwards. Unfortunately we don’t have any footage of the actual performance yet because we weren’t allowed to take pictures or video but we are supposed to get a DVD of all acts soon. So, perhaps I can include a better quality video of her dancing soon. Samantha is going to do ballet again this year and she is also keen on tap dancing also. So she may end up in two performances in next years recital. This entry was posted in Samantha on September 7, 2011 by jrand. This spring, Samantha finished preschool and Matthew finished grade two. We don’t really have any pictures related to Matthew’s last day but on Samantha’s last day, there was a big party. It was a chance for the kids to say good bye to each other and their teachers. Cynthia and I both attended and it was a great time. There was a pool party and it was a great day to spend an hour or so in the water. Samantha misses Connie who was a very special teacher for her. 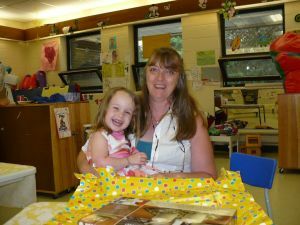 But soon enough, she will be starting junior kindergarten which is a big step for her. In April, Matthew and Samantha’s dojo held a karate tournament. Matthew did quite well at the previous one but Samantha was sick and couldn’t attend. She was very impressed with the trophy Matthew brought home so she was determined to make it to this one. Early in the morning, Samantha competed. In her class, they were split into groups of three and then asked to mimic the actions of their instructor while they were judged on their technique. Samantha ended up in a group of three with two older girls but in the end her score put her in second of the three. She was so excited when she was handed her trophy. In the previous tournament, Matthew was close to finishing his belt and was among the oldest in his class. He ended up bringing home a second place trophy that time. This time, he had progressed into an older age group so he was among the youngest and was just learning his new kata for the next belt. But he did very well. Since the tournament, he has continued to work hard and is still improving. I am sure he will do even better in future tournaments also. The video is a bit of fun using the new iMovie. It has templates for creating “movie trailers”. So, piecing together some of the raw video from the event, I put together the video above, brought to you buy Rand-omonium Pictures. Enjoy. This entry was posted in Matthew, Samantha on May 9, 2011 by jrand. We do things a bit differently at Easter at our house. Because Samantha is diabetic, the Easter Bunny doesn’t leave as much chocolate here. He does hide some chocolate eggs around the house but there are no chocolate bunnies. 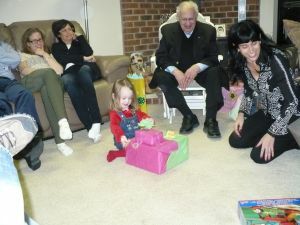 Instead, he gives a little gift to Matthew and Samantha. 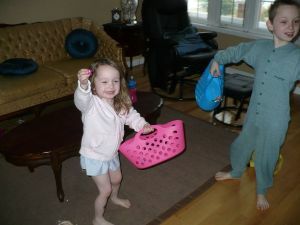 Samantha and Matthew grabbed their baskets Easter morning and started searching for the eggs. We encouraged Matthew to leave some of the easier ones behind for her sister to find and he focused on finding some of the ones which were more hidden. In the end, I think Samantha maybe gathered a couple more than Matthew did. In the video, you can see the moment when they found the presents the Easter Bunny left behind. It was a couple of Nerf guns which shoot foam darts. I guess the Easter Bunny assumed that the best approach for a couple of kids who argue as much as Matthew and Samantha is to arm them. Maybe a bit of “mutual assured destruction” will help. Later in the day, some good friends of ours came to visit and join us for dinner. I made roast cornish hens and it came out quite good and I think impressed our guests. After dinner, we played a bit of Rock Band before it got late and it was time to call it an evening. 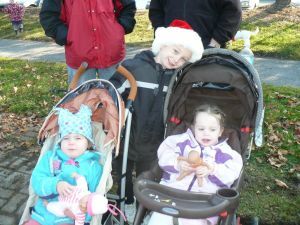 Samantha saw her first Santa Claus parade this year and Matthew hadn’t been to one in many years and probably didn’t remember it. 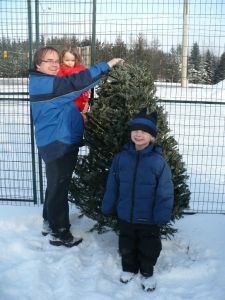 Matthew went to one in Kinburn a very long time ago but we had never made it to the one in Kanata until this year. Samantha found some of the moments loud like when a truck would pass and sound its horn. But she enjoyed the music. 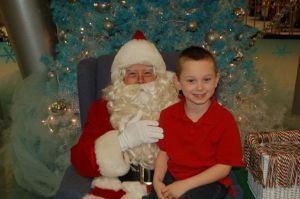 Matthew gathered candies and waited for Santa who finally came at the end riding atop a firetruck. 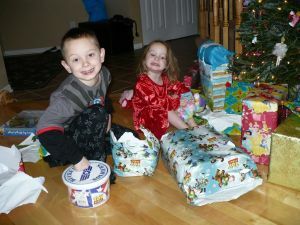 This was definitely a good start to the Christmas season for Matthew and Samantha. 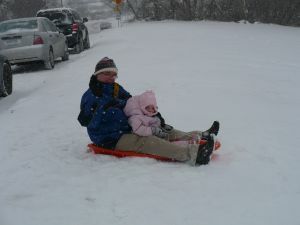 This entry was posted in Matthew, Samantha on January 3, 2011 by jrand. 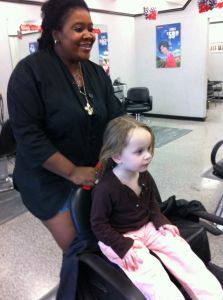 Although Samantha is more than three years old, she actually never had a haircut before. But, the time came that it really needed to be trimmed. More than that though, she got some really nice braids in her hair. Check out the pictures. 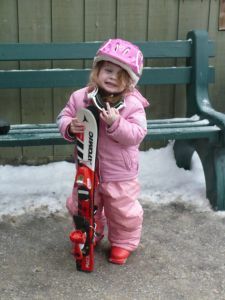 This entry was posted in Samantha on January 3, 2011 by jrand.